Muck Monsters of BC's Bad Lands. 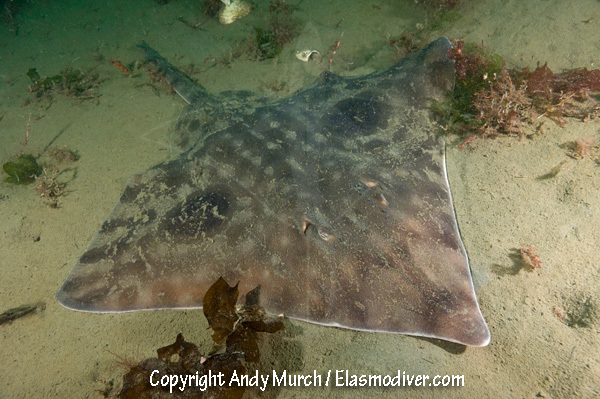 Skate and ratfish diving in Canada. Muck Monsters of BC’s Badlands. Descending through layers of heavy leafed bull kelp laden with yellowtail rockfish, I am extremely tempted to linger in Vancouver Island’s lush kelp forests, but tonight I am on a mission to explore British Columbia’s badlands. Although virtually ignored by visiting divers, the marine plateau that covers most of the Salish Sea is a haven for oddball creatures that are as alien and intriguing as the landscape they inhabit. Leveling off a meter above the muck, I spot my dive buddy scanning the substrate. Almost immediately, the hot purple reflections of a dozen tiny stubby squids (01) flicker in the beams of our modeling lights. The closest animal shrugs off its muddy blanket and tiptoes away from me over the sand. It shifts from deep plum to an exquisite two-tone gold and pink plumage, (02) which is probably a visual signal of some kind but the meaning is lost on my mammalian sensibilities. In the weird world of cephalopods, stubby squids and their relatives are hard to categorize. 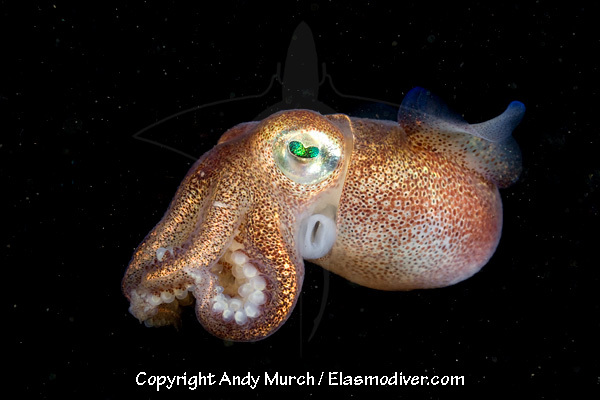 They are part of the bobtail squid family, which are not actually squids at all. They are more closely related to cuttlefishes and are poor swimmers that spend a great deal of their time submerged in the substrate. Of the 70 or so miniscule species that have been identified so far, each variant has its own unique color scheme. Some - like the aptly named pajama squid – have a bizarre pinstriped torso, but most sport opalescent skin tones that morph from one kaleidoscopic hue to the next as their mood or environment changes. Another stubby squid - this one about the size of a cherry - shoots upward into the water column perhaps hoping to make a quick getaway in the darkness. It tries out a few different looks then settles on a sparkling bronze cast (03) that is as close to camouflage as it can muster. When it reaches the reef, it suddenly transforms into an albino version of itself (04) and disappears among the ivory colored plumose anemones. Stealing myself away from the shimmering cephalopods, I take a quick compass bearing, and frog kick deeper into the marine desert. Like many terrestrial deserts, the terrain is scrubby rather than uniformly sandy. Moon snails and brittle stars navigate around palm tree shaped tubeworms and clumps of low lying lettuce kelp. When I eventually reach an area of monochrome mud, a who’s who of North Pacific flatfishes explode from their hiding places like motion triggered land mines (05). Nearby a sailfin sculpin (06) lowers its flag-like dorsal in a futile effort to evade detection. As I head towards it, camera at the ready, I become aware of two unnervingly huge, unblinking eyes looking back at me from below the sand. After a quick double take, my brain translates the image and the black irises become ocelli attached to the wings of a resting big skate (07). Big skates are the largest of North America’s skates growing up to a whopping 2.4 meters in length. They are also one of the most abundant species in BC waters but they are rarely seen on the reef itself so most divers never have the opportunity to encounter one. Their egg cases (08), which they lay in pairs, are equally enormous and contain up to 7 embryos that can remain inside their keratin capsules for more than a year before emerging. Lethargically, the enormous animal takes flight. I briefly fall into step beside it, marveling at its camouflaged dorsum and impressive wingspan but in no time the big skate outpaces me. 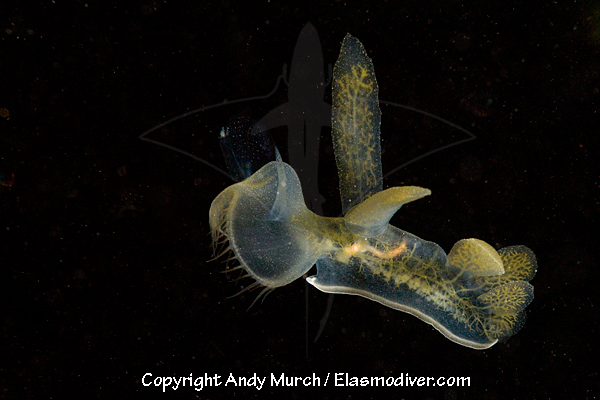 I break off pursuit and settle next to a ghostly white nudibranch that is almost the size of my hand. It is a type of tritonia (09), which thrives out here in the barrens. The tritonia is closing in on an orange sea pen; it’s favorite food. Like all nudibranchs, tritonia are unpalatable to most potential predators but they are fair game for BC’s gargantuan sunflower stars. One of these - the size of a wagon wheel - is in hot pursuit, which in the sunflower world, means shuffling along imperceptibly slowly on thousands of tiny protruding feet (10). I watch its progress for a while and then - to avoid a lengthy surface swim against the outrushing tide - I begin to arc back in the direction of the rocky reef. Flatfish continue to detonate at my approach and Dungeness crabs sink deeper into the dirt, much of which has been dumped here from the sprawling Frazer River, which dominates this part of the BC coastline. Without warning, a true denizen of the detritus flies towards me and proceeds to bounce off of my dome port. It is a chimaera or spotted ratfish. I can vaguely pick out others of its kind at the edge of the darkness, plowing through the mud in search of crustaceans, mollusks and other tasty tidbits (11). Although spotted ratfish – which have cartilaginous skeletons and are distantly related to sharks - occasionally show up on offshore reefs, they are far more common out here in the mud where their food supply is relatively abundant. If the laws of physics were slightly different and we could drop down a few hundred extra feet, ratfish would be one of the most common animals seen by divers in the Pacific Northwest. Constrained as we are at the upper limit of their vertical range, spotted ratfish sightings are still a special treat and this particular one seems determined to swim directly into my camera, perhaps enamored with its own reflection (12). 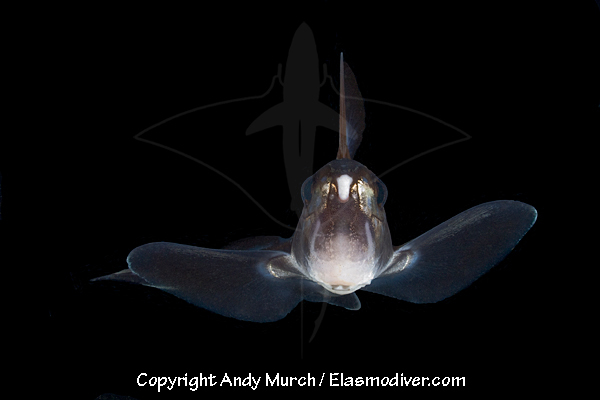 It is clearly a male, identifiable by its well-defined claspers and tenaculum; a protruding appendage with a Velcro-like pad on the ratfish’s forehead, which it uses to grasp the female when mating. I try to pull back to compose a profile shot but the ratfish continues battering my dome port. This behavior is very odd for such a normally shy animal and I take full advantage of the rare opportunity to capture some dynamic images. Temporarily blinded by my strobes, the ratfish eventually swims giddily away. Low on air, I too must head off, but I pause momentarily to wonder at a hooded nudibranch free swimming over the sand (13). Although commonly seen resting on kelp stalks and sea grass near the reef, the hooded nudibranch is pelagic in nature and this individual may travel many miles through the badlands before finding a suitable place to feed and procreate. It’s entire front end is dominated by a huge oral hood that works like a Venus fly trap. The fang-like sensors around the edge of the orifice tell the mouth to close when it runs into a tasty snack. For propulsion, the hooded nudibranch undulates its translucent body until it pulls itself up off the bottom and then rides the currents using its sail-like cerrata. Unexpectedly soon, the reef reappears. Like an astronaut returning from a moonwalk I embrace the familiar landmarks, but I am reluctant to leave the otherworldliness of the badlands. The marine plateau of the Salish Sea is truly where the wild things are. A place where form is only loosely controlled by function and design appears to have no boundaries. Just about anywhere along British Columbia’s rugged coastline you can expect to find a wealth of strange marine life beyond the reef. For an easy introduction to muck diving, try jumping off of Ogden Point Breakwater in Victoria and swimming out perpendicular to the reef. Ratfish and stubby squids are much easier to find at night. During the winter months, sunset can occur as early as 4pm making night diving that much easier. Make sure you bring a compass, a signaling device and a back up dive light or two or three! Study the tide tables and try not to drift too far from your entry/exit point.